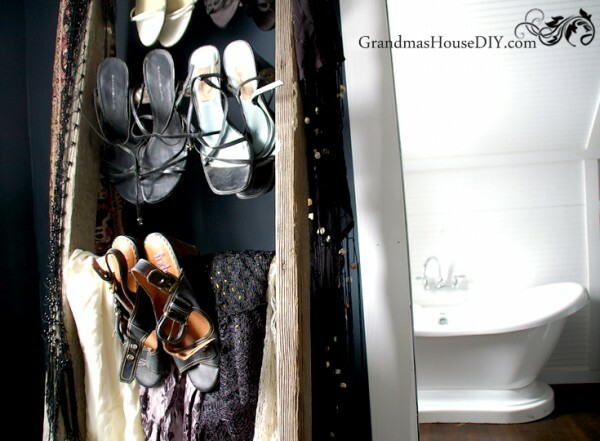 An old ladder shoe rack in our master bedroom closet DIY! 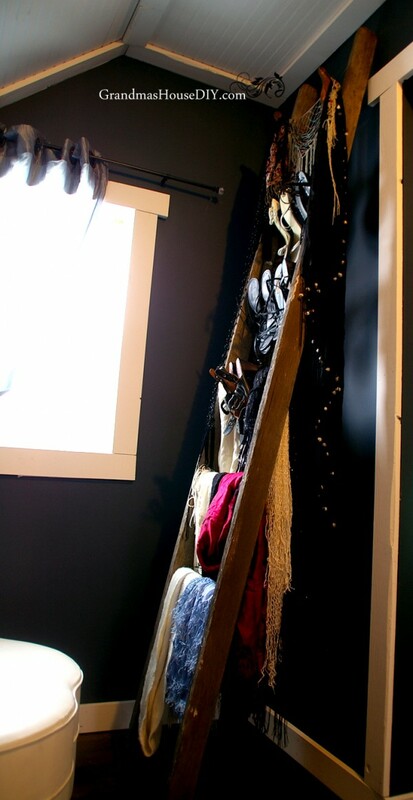 UPDATE: Go and check out our Master Closet reveal to see this project in action! You can see at the top of the ladder it still holds that AMAZING old hardware. You can’t really see it in the pictures but one of the rungs on the ladder was actually broken off one side and, initially, I had planned to make my cut to remove that so all of the rungs would be really stable. However, after making my measurements, I realized I would have to cut the top off the ladder to remove the broken rung and, thus, lose that beautiful old hardware. So, that was a no go! So, I cut the bottom off of the ladder and I was left with a mini ladder with four rungs that will definitely be finding another purpose somewhere in my home! I love the dark gray of the wood, I love the old paint spills probably from when Grandpa painted the barn or the house decades ago! When I made the cuts to remove the bottom portion of the ladder, I cut them at an angle with my jig saw so it would stand and lean better. I also put felt stickers on the bottom to protect my hardwood floors from my new ladder shoe rack. 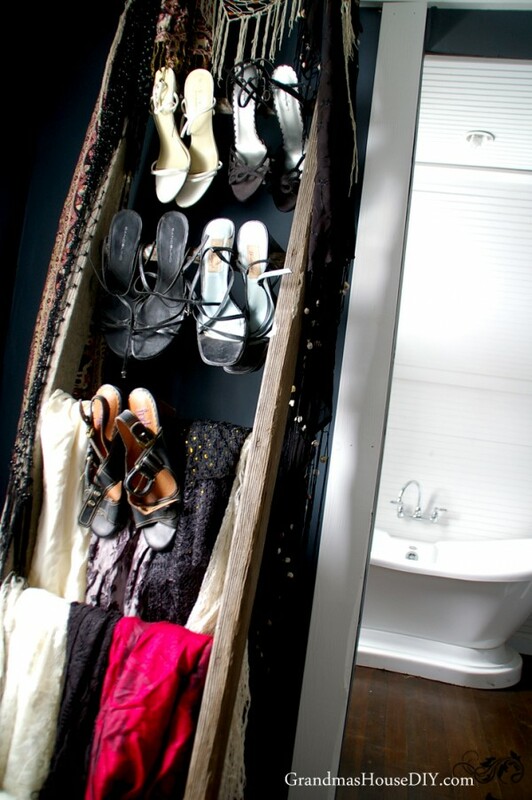 I had the perfect spot in my master bedroom closet for the ladder, tucked in the corner across from my white tufted leather hassock and right beside the door to my bathroom. I started digging and found all of my high heels and pretty throws that have been in storage for three years! I do believe I am do for a time to dress up all pretty and wear those high heels! As a ladder shoe rack I can’t believe how well it works! I was actually disappointed to realize that I had purged all but five pairs of heels from my collection when I moved two years ago. I might be a bit of a hoarder but, when it comes to things I won’t use, I’m just the opposite, if its going to be in a bin in storage for ten years without my ever looking at it, touching it, or needing it, I’m going to donate it. Which is what I did with what must have been at least a dozen pairs of high heels that I never wore. I did not, however, get rid of a single scarf or throw and I am so glad I didn’t! Now I have a beautiful place to hang all of them and shoe them off with the few high heels I have left! 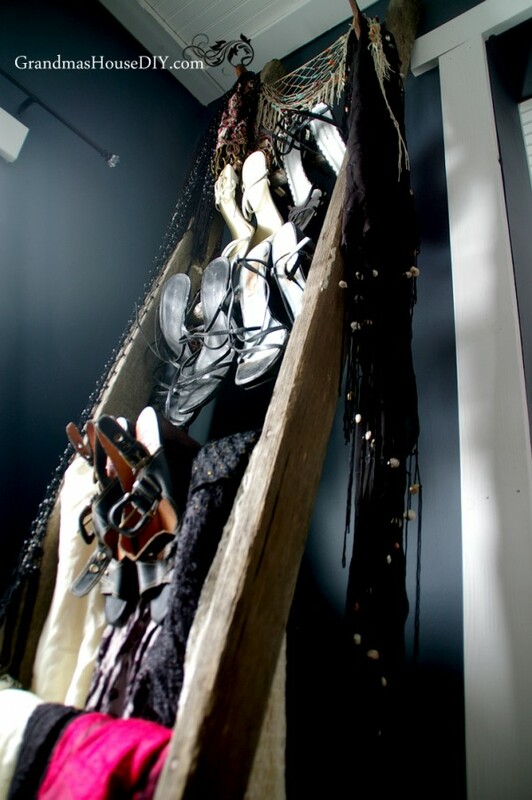 The old hardware at the top of the ladder was perfect for dangling several of my pretty throws. And all of the rungs (even the broken one!) supported the rest of my scarfs, throws and shoes with no problem! I can’t believe just how much use that can be had out of an old ladder! I wish I had a couple more of them because I would definitely put one in my living room as a blanket rack! Thanks for stopping by guys and please consider sharing my ladder shoe rack – every share and visit helps keep my little farm running and helps me with future projects too! I hope you all have a wonderful holiday! I love this!! How clever! Your dark walls and that bathroom!!! Gorgeous!!! Marci, thank you so much!! What a great idea! Thanks for sharing on the Pleasures of the NW’s DIY link up! Love it! It turned out just great. Good job. Thanks for sharing with #overthemoon! Such a genius idea. Thank you for sharing with us at #HomeMattersParty. We would love to have again next week. Sahana, thank you for coming by!! That’s a fun idea~and who doesn’t need more storage space in an old house, plus it makes a gorgeous display. I have a bit of a ladder fetish! I have a similar one leaning against my porch pillar with a Clematis growing up it. Love what you did with yours, and yes; I love the character that the chippiness and paint splatters give to it! Thanks for sharing with SYC. Jann, I totally get! 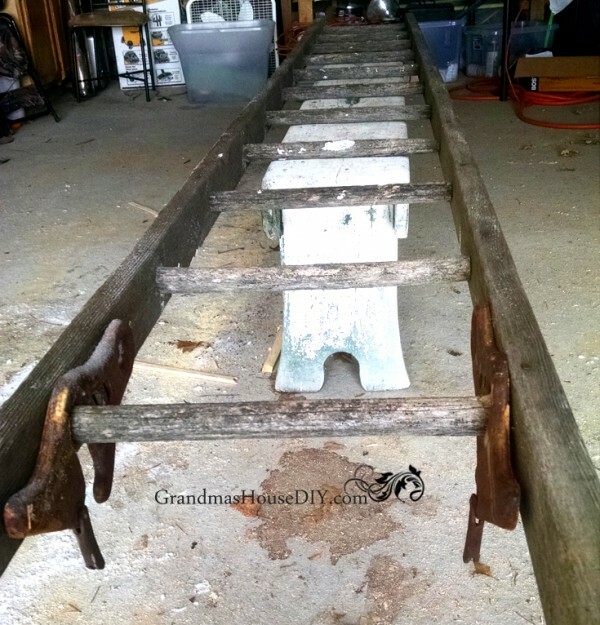 Old ladders are SO cool, I have two others that I’m trying to come up with something to do with, one from each of my Grandpa’s 🙂 Thanks for coming by! What a great idea! I love old ladders and this is an extremely clever way to use one! Thanks for sharing! Hey Carla, my biggest fault when it comes to keeping clothes is that they’re still “nice” and “good” so I want to keep them even though somehow along the way I got to hate them and will probably never wear them lol. So, now I keep a donate bin right there in my closet for my husband and me, if I put it on and don’t like it for a split second I take it off and throw it in the bin! Thanks for commenting!! Oh, I love this! Ladders are useful in so many ways. It looks like the ladder you salvaged has the perfect amount of rustic charm, too. Thank you! I love being able to recycle things like this from my grandparents when a lot of folks would just scrap them! 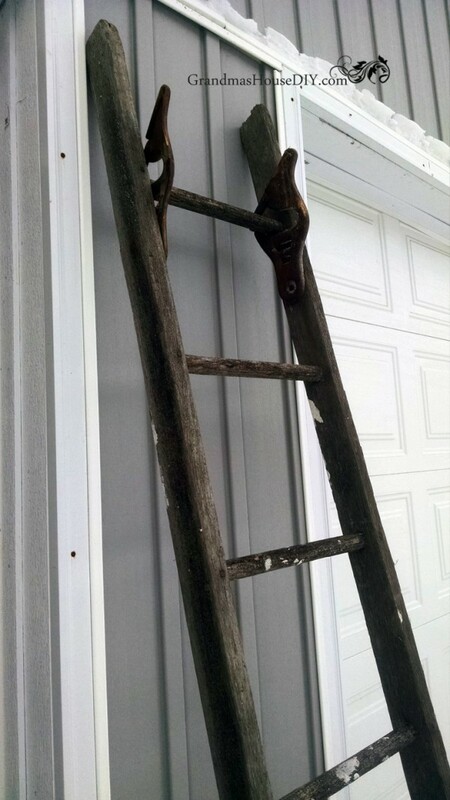 I love this old ladder. How lovely and looks so much better in your room. Thank you for sharing at Dishing it and Digging it link party. wow! This is the cutest shoe/scarf holder I have seen yet! LOVE it! And that rusty hardware at the top is a major score, glad you kept those rusty gems attached! Thanks Audra! As soon as I saw the old hardware I knew I had to keep it! Such a cute idea! I love how you can see all the scarves at a glance! That’s a great way of utilizing old pieces. I have an old ladder in my place too that I love but don’t have anything hanging on it. It just serves as decor. Love this transformation! What a unique way to use a ladder. I’ve seen them as blanket holders before but never as a shoe holder! What a unique, creative, and beautiful idea! I love it (and I love the worn look of that ladder)! 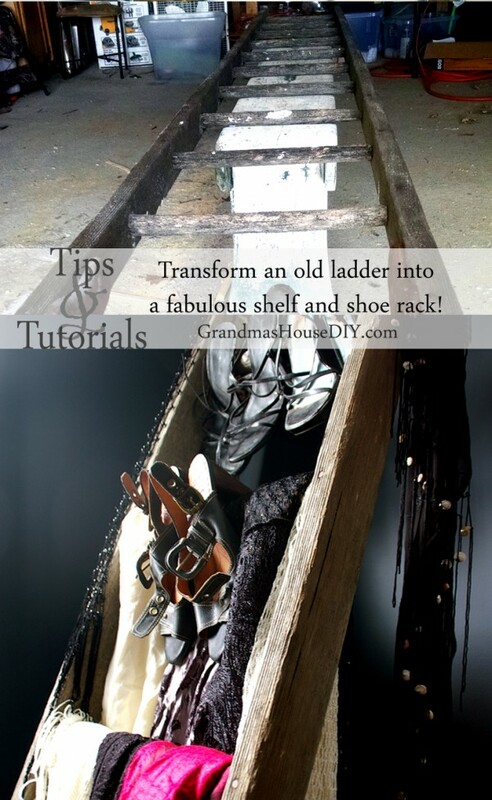 What a brilliant idea to repurpose a old ladder. Something pretty clever I must say. Thanks for sharing at the Pit Stop! Thank you Julie! I love that I have a safe place for my high heals now! What a creative idea! 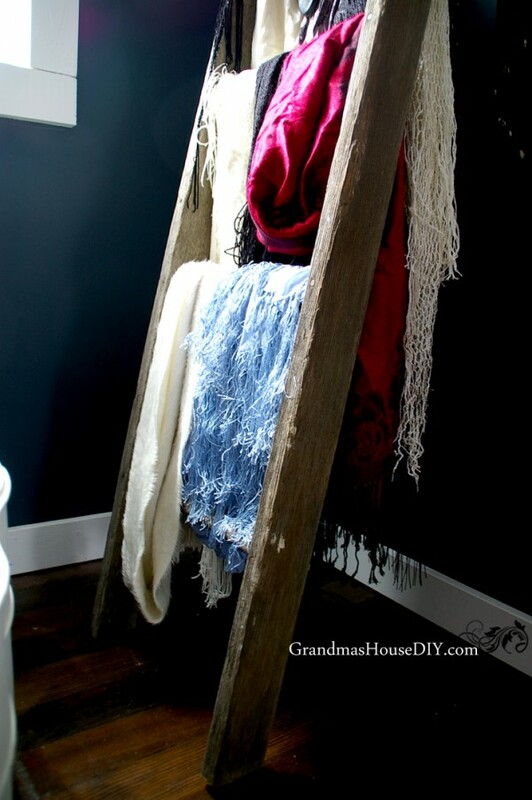 My wife loves old ladders and wants to do something like this! Love how it turned out, thanks for sharing! It was SO easy Ryan! And it really turned into one of my favorite projects! Thanks for stopping by! It is so nice when a project turns out well and ends up being just what you wanted it to be! Your ladder rack looks great. Love this! Such a good idea. Thanks for sharing at the Friday at the Fire Station link-up! Hi Taralynn. I really enjoy reading your posts that include a repurpose of a family heirloom. Its a beautiful thing to see. 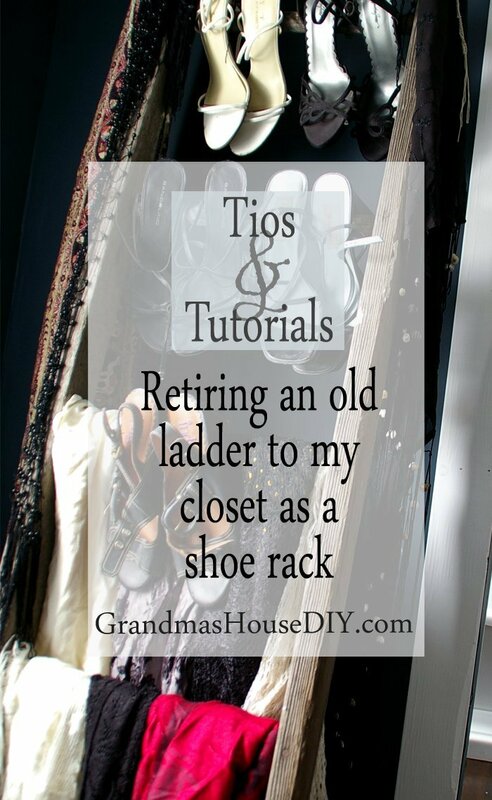 This ladder is perfect what a great keepsake and useful article as well. I love the idea! Thanks for sharing at Sew It Cook It Craft It. Thanks so much Emily! I can’t believe how well it works for my shoes and everything! I don’t wear heels because I am tall, but I can see how this project could be revamped. So awesome pinned and shared, followed you from the Thoughtful Thursdays party. I love how you value things from your loved ones and turn them into something more useful. Thank you for the inspiration!